Krissie started a food themed swap and since I didn't have any food themed stamps, I decided not to join. But seeing as its Sunday and football season - I pretty much am confined to my stamping room, unless I want to watch a bunch of big men in shiny tights touch each other's bums. Okay, i don't hate football THAT much.... lol, but I would rather be stamping! So... I was rifling through my stuff and came accross a shapabilites that I had purchased a while ago. So I immediately thought of Krissie's swap and since we're meeting up on the 27th for dinner, I had time to join! I have been hoarding this DSP from SU! for quite some time, and if you follow my blog, you may realize that I have a hoarding problem with papers and images =) But when something comes together so easily, i'm happy to slice it all up! 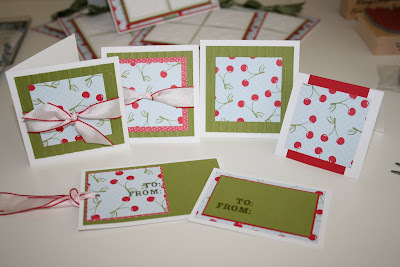 The layout I CASED from a card I had seen. If I remember correctly, it is from the site I purchased the shapabilties from. Ask me now what site that was?! No IDEA! I also barely stamped a THING on this card. 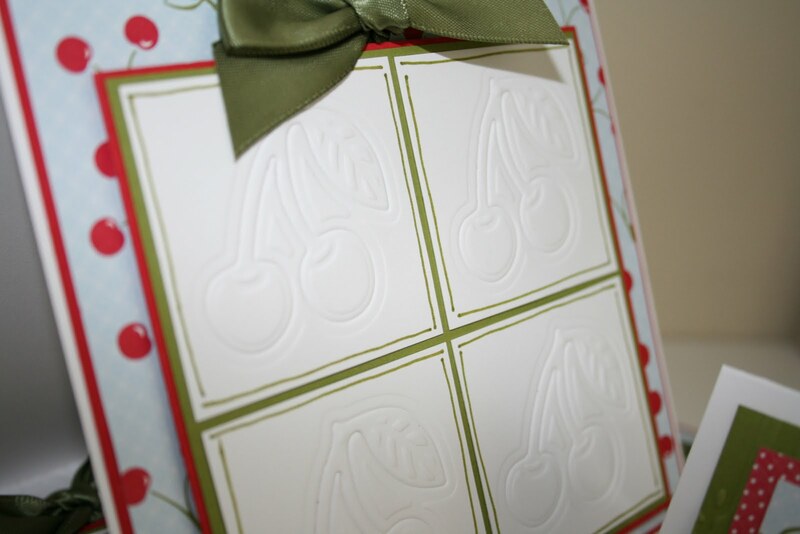 The cherry shapabilities are a great focal point, and I was stuck for a sentiment anyways. So I used a stamp from a CTMH set I had. It says Happy at the top and there are checkboxes for "day" "anniversary" "birthday" "holiday" and "go lucky". I think this card would be great for Happy Day! 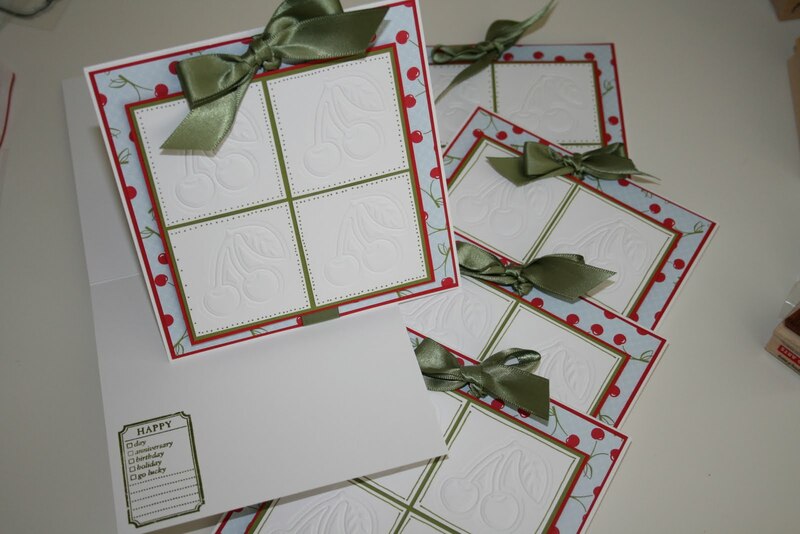 I have been ooohing and ahhing over the Cricut, Silouhette, electric Big shot, the Spellbinders presto punch, the Xyron Creatopia.. all these wonderful things that can do so much! I wish, I drool, and then I check my pocketbook! So, I thought about the tools I have, that I LOVE and wouldn't want to stamp without... and that I have been creating without the "mega tools" for years. So what do i have today, that I wouldn't want to stamp without?? Don't get me wrong, all this thinking will probably not deter me from putting in another order for supplies in the near future, and I am STILL drooling over those "mega tools". So if you had to go "back to basics" ~ what could you not stamp without? I had some leftover scraps from this project, so I whipped up a few matching tags. They're not all the same, but I'll be putting one in with each card randomly. Hope everyone had a fantastic long weekend! Here is another project I made for the latest craft show. I have made coasters before. Many. For the first show, I bought an entire box of tiles and went to town, only to have nearly every one smudge and run when i sealed it. It was terribly discouraging, and I think I showed up at the show with a handful, IF that. Before the last show, I decided to try a different tile, and a different sealant. It worked!! My trouble then, was deciding what images were best for a coaster! I had done alot with swirlys and sayings, flowers and plant life - but I wanted something different and I don't know why it didn't dawn on me until a week before he show that I could use images of people and animals! I started with some CC Designs (Coffee Kiki, how more appropriate can you get? ), and some Anyas and eventually got up the nerve to ink up a recently purchased Stampavie image. That's her you see there. The image is Gillian Roberts - "Being Together" from Stampavie. I think its one of the most adorable images I have ever seen. One of the best things about these is that your tile DOES NOT have to be perfect! The differences in markings make each one unique and you can find similar ones if you want to make a set. There's a few things I learned that might help a first timer, that I'll pass along so you can avoid some of the frustration I went through with the useless box I had! First, choose a very smooth tile. I like a smooth tumbled marble. Next, don't press too hard on your image, but use a juicy pad. If you're going to seal your tile (which I recommend and is a must if you are coloring), use a good quality poly. I used Verathane. Spray a thin quick layer, allow it to dry and repeat a few times for a good seal. Don't saturate your tile or else you will run the chance of your artwork smudging and running!! Color as much as you want to! I have used lots of mediums on my tiles. You must stamp your image with Staz On. Momento does not work. But color, the sky's the limit! I have used markers, copics (careful you do not touch the Staz On with your copic or it will blend your line). but my favorite is watercolor pencils. 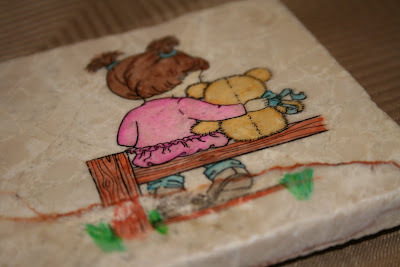 You get the watercoloring effect on the the tile and you can shade very well with it and add/take away color as needed. Go! Go! I wanna see you make one now!